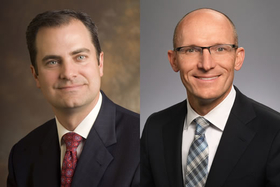 Emory Healthcare announced leadership changes Thursday the academic health system said are designed to support its growth. Dane Peterson, who currently serves as Emory Healthcare's hospital group president, will become Emory's chief operating officer as of Sept. 1. He's been with the system for 11 years, first as CEO of Emory University Hospital Midtown, then as hospital group president in 2014. As COO, Peterson will oversee systemwide operations, and will work to ensure effective and efficient processes across care settings and teams. He'll focus on translating strategy into action and operational excellence, according to an Emory news release. Dr. Bryce Gartland, currently the CEO of Emory University Hospital, Emory University Orthopaedics & Spine Hospital and Emory Wesley Woods Hospital, will assume Peterson's current position, hospital group president, on Sept. 1. He joined the health system 13 years ago as a hospitalist physician and has served in several leadership roles. In his new role, Gartland will oversee Emory's hospitals and other large system departments. He will be the co-chief of clinical operations with the Emory Healthcare physician group president. "Dane has been closely integrated in all aspects of Emory Healthcare operations for many years and will prove to be an exceptional leader in this new role," Dr. Jonathan Lewin, Emory's CEO, said in a statement. "Bryce is a respected, dynamic leader, and we are excited to welcome him into his new position overseeing our hospitals and system clinical essential services." Emory is searching for a replacement to fill Gartland's current position. Emory announced in June it was partnering with Kaiser Permanente to create a fully integrated healthcare experience at Emory University Hospital Midtown and Emory St. Joseph's Hospital in Atlanta.